Little Bonsai, the bulldog puppy whose congenital abnormalities left him with only "half a body," made headlines earlier this month for his upbeat personality in the face of incredible odds. And now the spunky little survivor is continuing to make a splash. On Wednesday, Bonsai's caretakers at Friends of Emma uploaded some adorable photos of Bonsai swimming around in a kiddie pool. What a great way to beat the heat and help Bonsai get the exercise he needs to get stronger! Bonsai even splashed around with his pit bull friend Ransom. 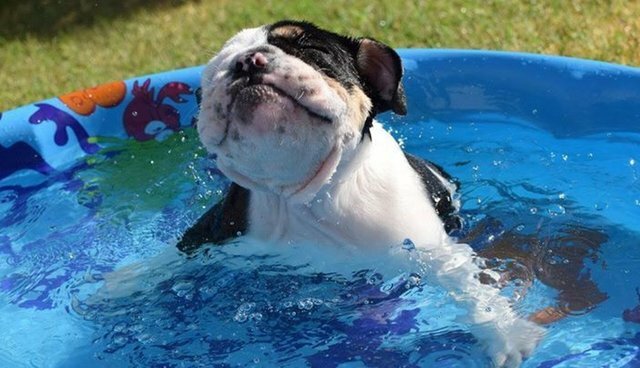 There's nothing like a summer pool party to keep your spirits up. Bonsai's caretakers keep up a Facebook page for anyone who wants to follow his journey, and they've also set up a fundraising page to raise money to cover the cost of Bonsai's medical care. Bonsai's story is just more proof that pets with special needs can be as loving, sweet and playful as any other dogs and cats. Hopefully some of Bonsai's fans on social media will be more likely to consider adopting an animal with special needs. If you're ready to adopt a pet with special needs, check out available rescues on Adopt-a-Pet.com.